The movie poster for the classic 1988 action movie "Die Hard". The recent death of James Shigeta, who played Joseph Takagi, a doomed businessman in the first “Die Hard” movie way back in the summer of 1988, reminded me of a pivotal summer in my life. There was something old, something new, something borrowed, and something blue. I had gone off to university in the fall of 1987 full of trepidation. I needn’t have worried, because I had one of the greatest years of my life. It still ranks near the top. Then, in the flash of a trip in a Pinto from Edmonton, it was over. I was back on the same old farm, working the same old job at the greenhouse. Awaiting me in the fall at university was a new job I was really excited about, so the days went by so slowly. Worse yet, my best friend Chris Vining had gone up north for the summer to work and stay with his dad, so I didn’t have my homey to hang out with. There were several new things that ultimately made the time pass, and eventually just a little bit sad to leave, when I finally did. In the eight months I was away, Lethbridge had undergone some significant changes, especially downtown. Mall space had almost doubled, with the opening of the Park Place Mall and the addition of a second floor to the Lethbridge Centre, or Woodward’s Mall, as we called it. Beyond all the new stores, which did not excite me that much, was the addition of more movie theatres. Up to that point, Lethbridge was served by a total of six screens: the Paramount Theatre downtown had two; the Lethbridge Centre Theatre, also downtown had two; and College Mall, had two called “College Cinema 2”. And, I believe, they were all owned by the same person. In any event, they were all Famous Players theatres. And there was the Green Acres Drive-In, but that was not an option a) in the winter; and b) without a car. The new mall had six screens, and was a Cineplex-Odeon, meaning way more movie selection. It opened not too long before I got home from university, and would become a frequent destination over the next four months. I would see “Cocktail”, “Sunset”, and others. I also renewed a friendship I had made the previous summer with a buddy named BJ, or Bill. He was the younger brother of my neighbour and lifelong friend. We hung out a fair bit, taking in a bunch of movies. We also listened to a lot of music together. Near the end of that summer, I bought a tape I had wanted for a long time: Richard Marx’s debut, self-titled album. Me and Bill used to joke about one of the Richard Marx songs, “Don’t Mean Nothing” so he chuckled when I told him I bought it. At the same time, we were getting into Honeymoon Suite’s latest single, “Love Changes Everything”. We both loved their last album, “The Big Prize”, and BJ’s brother actually had also bought their self-titled debut album through Columbia House. Needless to say, BJ bought “Racing After Midnight”, the aforementioned latest album from those rockers from Niagara Falls. So, we decided to swap tapes. In essence we were borrowing from each other. Sadly, I left for university before we could trade back, and I still have “Racing After Midnight” sitting in my closet. I’m sure Richard Marx is living in a landfill, somewhere or, at best, at the bottom of a closet or a box in someone’s basement. The funny thing was, that I got into a pretty good routine as the summer went on. I really had a good time with Bill. He was still in high school, going into Grade 12, so I still had contact with that scene. Plus he was a bit of a chick magnet, so girls were around more than I had ever experienced (which had been never, to be honest). So, when I finally did get to leave, I was a bit blue. I was saying goodbye to a buddy. The funny thing is, I have never seen him since, in the almost 26 years that have passed. Amid all this, the movie “Die Hard” came to town. I was curious to see it because it starred Bruce Willis who, up until then had been starring in “Moonlighting” opposite Cybill Shepard. I really had not seen much advertising on the movie but, because Willis’ role in “Moonlighting” was so goofy, I was really curious to see him in something else. Plus, Bill wanted to go, we had either seen everything else or didn’t want to, and movies were dirt cheap to go to. Whatever the reason, we were not disappointed. “Die Hard” is set during the Christmas season, making the summer release a bit odd. John McClane (Willis) is a policeman estranged from his wife, looking to meet up with his children. Through some misfortune, he ends up trapped inside a skyscraper, the Nakatomi Plaza, just as some crooks are trying to rob it, under the guise of a terrorist attack. What ensues is a man-against-the-odds battle. McClane uses his skills and instincts as a police officer to slowly whittle down his enemy, find out what their ultimate goal is, and stop them – while trying to survive. The pacing of the movie is perfect, and Willis shows that he was more than David Addison, his wisecracking, laid back character on “Moonlighting”. Oh, he’s still cracking wise, but he is much more wound up, high strung, and intense. And he provides some of the best one-liners of the year. The best of course was, “Yippy kiyay mother fu--er”, along with, “I have a gun too”, and “That’s Helsinki, Sweden.” “Die Hard” ended up providing me and Bill the slang and inside jokes we used for the rest of the summer (“Batman” did the same thing for me and my friend Sean the following summer). “Die Hard” would go on to spawn a bunch of sequels over the next 25 years. I only saw one, and it was pretty good too, two summers later, but nothing beats the original, which is still one of my favourite action movies of all time. It’s funny that I have been using this wedding metaphor, because it was often described in the succeeding three years I was married to my job and life in res. The summer of 1988 really did have something old, something new, something borrowed, and something blue. It was the end of my old life on the farm. When I left, I never lived there again. I spent the next three school years and two intervening summers in res. Amid that, my parents sold their farm. It was also the time to find a new friend, visit a new theatre, and see new movies. There was something borrowed, that Honeymoon Suite tape. I still see it every so often, and it reminds me of Bill and the summer of ’88. And there was something blue, my farewell to a friend and ultimately, although I did not know it at the time, a way of life. 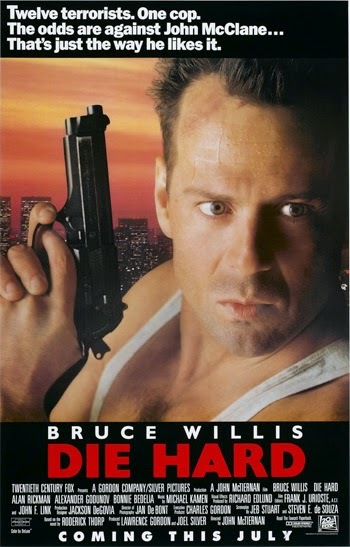 I will always associate “Die Hard” with that period, and it always brings back memories. It’s unfortunate that it took the death of James Shigeta to remind me again.